Why buy a boat tour company rather than just buying a boat and setting up on your own? The safety of an established business, with an immediate income stream. Someone has done the hard work of setting up the business from the ground up, establishing a good reputation, gaining and keeping customers. All you have to do is walk in and take over. You know from previous years how it’s likely to work for you financially so all you have to do is focus on the best bit – the boat trips. You may find it difficult to get insurance for a startup RIB business. If you buy a company with an established safety record and no claims history, you benefit significantly. We have an excellent safety and no claims insurance record. RIB tours are now tremendously popular throughout the UK. The danger is that the market in some areas may be saturated – seaside locations are usually small places. If you’re going to start a new business you’ll have to offer something that no-one else does. Shearwater is a pretty convincing USP: precision manoeuvring for a unique cave experience, awesome fun with jet boat spins or ‘doughnuts’, enabling us to offer a unique experience: an adventure activity and wildlife trip in one. It also enables us to work from locations which most boats can’t, for example beaches. 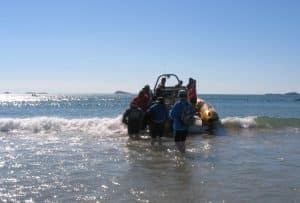 St Davids has established itself over the decades as a tourist destination for boat tours. It has several successful boat operators, all doing different things. The area is well known for its unspoilt beaches and the beauty of its coastline but also its islands and tremendous range of wildlife. 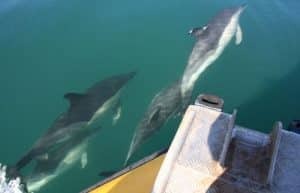 We are extremely fortunate to have Ramsey Island, with its fascinating range of caves and coves and such varied wildlife, on our doorstep – it’s a 5 minute hop from St Justinian. Further afield but still within easy distance (sea conditions permitting) we have the Bishops and Clerks, Grassholm, the Smalls lighthouse and the Celtic Deep, one of the best areas in the UK for cetacean watching. What about setting up somewhere where there’s no competition? 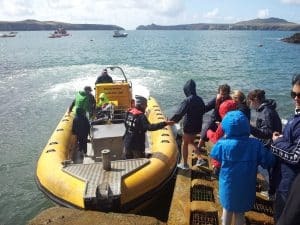 The idea of being the only boat tour operator may sound appealing but it would be worth asking yourself why, in a world where power boat trips are so popular, no-one is operating where you’re thinking of operating. If you can come up with a good reason then you may have a great opportunity but you really need to investigate your planned area of operation thoroughly. Is there much to see? What wildlife is resident locally and for which periods in the year? Is the cultural history of your proposed area interesting? Are there caves to explore or landmarks? St Davids is a popular tourist attraction in its own right, with its cathedral, galleries and beaches. Many people come back to this smallest city in the UK with fond memories of seaside holidays here as children. Visitors naturally look for things to do and many choose to go on boat trips, not just once but every time they visit. St Davids is far more than a seaside town. The cathedral and Bishop’s palace testify to its historical roots and it is home to a variety of artists. It is also home to a thriving adventure activity culture. Buying a company with a boat ready to go saves time. New boats and engines need to be run in and any niggles sorted out. If someone is selling you their business with their boat then they will have had to work through this for you. Of course mechanical issues can strike at any time but they’re much less likely in a well maintained boat that you can see is ready and up and running. The boat is particularly important if it’s part of the brand, if it’s unusual. Forgive the obvious point but finding a good second-hand RIB with outboards is easy. You won’t find another Shearwater 🙂 . Do you need a jet boat? Can you use something cheaper and easier to find? That depends on whether or not you have or are likely to have competition. It takes years to establish a business, a strong brand and reputation and simply for people to find out about you. 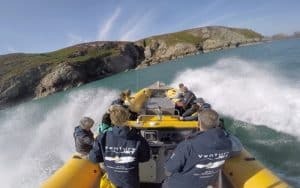 If someone takes over Venture Jet we can save them a great deal of time by by handing over an established name and customer base and by showing them how to get the most out of the boat, the islands and the wildlife. If you buy a company all the training manuals, risk assessments etc should be ready waiting for you to edit as you please – or simply use out of the box. It will save you a huge amount of time and enable you to get straight out and do what you want to do – the boat bit! Existing regular and repeat custom and an established website mean regular bookings, avoiding the start-up business problem of empty days when the phone doesn’t ring because nobody knows yet how good you are. On customer review sites such as Facebook, Google, Yell and TripAdvisor. Commercially – a proven safety and no claims insurance record will make insurance easier and less expensive than if you were starting a company from scratch. If you buy an established company you will benefit from the brand, the market reputation, the up and running marketing. You can either run with the existing marketing, at least while you find your feet, or change things to suit your style but either way you can’t beat a good market presence. If we pass on the business we will make marketing materials (photos, videos, logos and online and print materials) available to the new owner, saving a huge amount of time and expense. It takes time to get a good website and have good referral links from other sites. The existing owners should be able to discuss advertising opportunities with you and to tell you what works best. That sort of market research is invaluable and takes considerable time to accrue. Existing owners should also be able to tell you what works best for different types of customers. It takes time to work out who your customers might be and what they want. The existing owners already know. That provides a great place for you to start your empire 🙂 .